I was told of a new wool shop in the nearby town so set off on my trusty bicycle (the tyres managed to stay up – in my book that is trusty) along the glorious flat promenade with the expectation of wooly wonders to behold. Yes I do get the irony, wool is a odd obsession in the sunshine but then I make no claims to be level headed and logical! The shop itself was a hobby store, which is wonderful but the wool section merely had a few balls of very cheap wool. 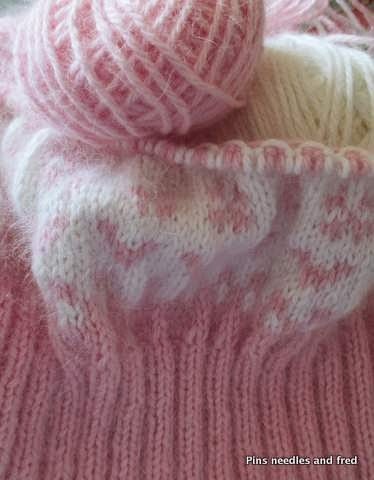 I wanted some angora as the jumper I am knitting is eating the wool at rather a fast rate and I may only really have enough for a tea cosy! I asked the shop owner about other types of wool and she told me that sadly it just did not sell – her customers just wanted the cheaper balls. It took me back a few years when I remember standing in John Lewis which had some fabulous wool for sale – my simple calculations estimated the cost of a jumper to be in the region of £80 at the time it was beyond my budget. I remember my frustration – surely they must realise that you can buy a jumper in a store ready made for about £30 what were they thinking? Now my opinion is beginning to shift – I have become disconnected with the making process and my value system is based around the cost of buying something in the shops, often made in countries where wages are low – I am beginning to wake up to how much it has warped my values and my expectations. I see rails and rails of clothes and jumpers in charity shops, worn for a season or two then simply discarded, if it costs us so little then why on earth would we value it? Yet our resources are not limitless – we need to understand where this direction is headed. If all our money is being spent in shops -eventually we will lose our ability to make anything, skills will disappear – we will become dependent and ultimately at their mercy. Moreover, we simply cannot sustain this concept of throw away that pervades everything we buy from bread, clothes, through to white goods and furniture. It is not a fast easy process to create wool, it needs to be teased, spun and dyed that means hours of work by someone and it is my choice to decide if that someone is sitting in a factory in a third world country or a farmer’s wife making extra money to make ends meet in the UK. I get a great deal of satisfaction from creating something with love, care and consideration, why not then have the same reverence for the raw materials? How much nicer it would be to wear something that had been lovingly made from sheep to my fingers – something that would be treasured for years to come. If I wear my jumper for eight years then it will only amount to £10 a year – it brings the cost into a more realistic amount. For me, knitting is a sensory experience – I made an item with some of this £1.99 /100g wool – it was a waste. The garment simply did not feel nice to wear and knitting with it was not pleasant either. I spend a great deal of time in wool shops touching the wool – I want something soft and comforting next to my skin and if it is comfortable to wear then I won’t be parting with it easily. 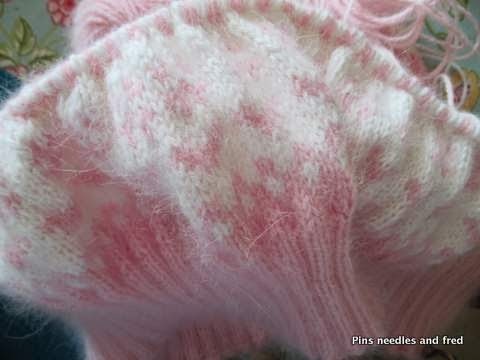 Here is sneak peek at what I am making, what you cannot do is feel how wonderfully soft and downy it is. I will do a post about fair isle knitting and patterns soon. In the meantime happy knitting!